I was exiting the rotunda of Cathedral City Hall after a talk by Agnes Pelton scholar Michael Zakian. He had just finished saying that Pelton’s abstracts are rare and becoming more and more valuable. “We think we might have found a new one today,” he added. I was thinking about that comment when I spotted a tanned, athletic-looking woman carrying a cardboard box, about the dimensions of a painting. On a hunch I asked what was in the box. Glenda Rice opened the flaps and slowly extracted a pale, quivering beauty of a painting: The newly-found Pelton abstract. The story of how a retired claims manager saved Translation from the junk heap should inspire arts novices everywhere. Glenda and her husband Rick, a retired police officer, look like they might know a lot about snowboarding or sailing—but the San Clemente couple admittedly knows little about art. Glenda did have a first cousin, Mario Acord, who was an artist as well as a skier and mountain biker. He lived in Laguna Beach in the 1970’s and later moved to Crested Butte, Colorado. He had an interest in esoteric philosophies, and occasionally collected paintings he admired. 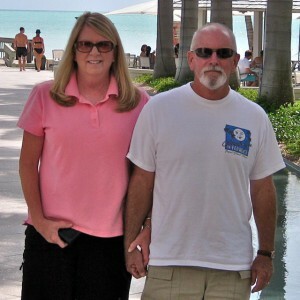 Three years ago, with his health failing, Acord moved to an assisted living center in Tucson. While visiting him there, Glenda first noticed the painting on the wall of his room. At the bottom of the frame were pillows or clouds or mountains; from there twin rays or tendrils twined together and sprouted heavenward. The background colors were otherworldly yellows and blues. When her cousin died last year, his conservator took first dibs on his belongings. What was left was placed in a pile for the garbage or the Goodwill. That’s when Glenda and Rick drove out to Tucson and in the pile of throw-aways, they found the painting. Glenda took it home. “My sister said she thought it was the ugliest thing she’d ever seen. My husband said: ‘It doesn’t go with anything in our house. '” She assured him she’d tuck it away in her sewing room. The painting had been stored in a hot Tucson garage for some time after Acord died, so some of the paint had a baked quality. The frame was old and chipped. There was a signature, but it was so faint as to be unnoticeable. On the back someone had written: Agnes Pelton–Cathedral City–Calif. Glenda started Googling to see if she could find anything on the painter. Right away she began getting clues that her cast-off might be more than a sewing room trinket. Pelton was a pioneering American modernist, she read, who moved to Cathedral City in 1932. She’d been featured in a groundbreaking exhibit, Illumination, at the Orange County Museum of Art in 2009. 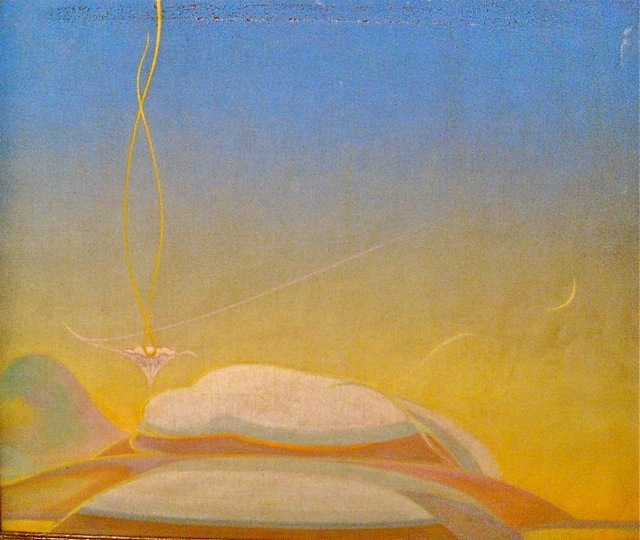 Pelton studied transcendental literature and was always aiming to link heaven and earth in her abstracts—a focus that might have appealed to Acord. Glenda contacted the curator of the exhibit, Karen Moss, who told her to talk to Michael Zakian, former curator at the Palm Springs Art Museum, and now an art history professor at Pepperdine University. 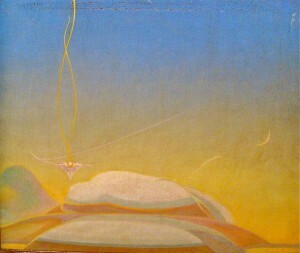 Zakian wrote the classic book Agnes Pelton: Poet of Nature. When Zakian told Glenda Rice he was giving a talk on Pelton in Cathedral City on April 21, 2012, she and Rick decided to make the drive out with their painting. Just before he started his talk, Zakian got his first look at the previously unknown Pelton—dating from the late 1930s. “Isn’t this sweet,” he exclaimed. “Sweet” meaning not darling, but awesome. So what was this cast-off worth? The couple inquired with Bonham’s auction house who said they’d list it for $10-15,000 but Zakian told the couple it was probably worth much more. Anyway, Glenda is not looking for buyers. She went to some trouble to rescue this stray and now she’s keeping it. The big question: Why did Glenda even notice the painting in the first place? No one told her “This is California’s Georgia O’Keeffe.” No one said anything at all. She and her cousin never spoke of the painting. Glenda just kept looking and found it curiously soothing. The takeaway for novices and experts alike: You too might rescue a masterpiece just by stubbornly sticking with what you like. WOW Amazing Just a magical image. I am sure Agnes had something to do with saving it. Thank you Glenda. I hope one day you will let me view this masterpiece in person. I just drove all the way to New Mexico and photographed White Fire, the painting that was hung over my fireplace on Michael’s book. And thanks Ann for keeping the fires burning. How exciting. Wish I had relatives with Pelton’s in the garage. This is thrilling! What a find. SO glad Glenda had the presence of mind to keep it, and then to stay with it and let it work its magic. Thank you, Glenda, for bringing it to light for the rest of us, and huge thanks to Ann for her tireless efforts on behalf of Agnes Pelton and other desert artists. I have 2 water colors by Agnes Pelton from 1959. They appear to be of redwood trees.I had heard a story of her being in Yosemite shortly before she passed away, with Georgia O’Keefe.One is a finished water color and the other is unfinished with her notes on it saying what she was going to do in the finished painting.I have had her signature verified by a very competent curator in Palm Springs.I purchased these two works for $30.00 each from a man that claims to have found them among some works found in her house while renovating.Can anyone verify this or any part of it? Wonderful. Who knows what else Agnes did that is yet undiscovered.